The Cactaceae family's spiny, stemlike shrubs and trees, such as prickly pear (Opuntia spp. ), Whipple cholla (Cylindropuntia whipplei) and saguaro (Carnegiea gigantea), are known for their dangerous spikes, floral displays and ability to store large amounts of water. Despite their vigorous growth, however, these desert succulents are easily destabilized. A shallow root system and root damage from rot, particularly on a tall or leggy specimen, can cause leaning or total collapse of the plant, and staking the cactus may be necessary. Cacti are hardy in a variety of U.S. Department of Agriculture (USDA) plant hardiness zones, depending on the variety. Prickly pear, for example, is hardy in USDA zones 3b through 11, Whipple cholla in zones 5 to 10 and saguaro in zones 9 through 10. Put on protective clothing, including work gloves, safety goggles, a long-sleeved shirt and long pants. A cactus' spines can cause severe injury. Create a collar to secure the cactus' stem. Wrap non-adhesive horticultural tape loosely around the cactus' midsection between its spines. Knot or staple the tape to itself to hold it in place. Tap two steel, 8-foot-tall T-stakes 2 inches into the ground on opposite sides of the cactus' stem, using a wooden mallet for the task. Slide a fence-post driver over one of the stakes, and pump the fence-post driver's handle to drive the stake 3 feet into the ground. Drive the second stake 3 feet into the ground by using the fence-post driver. Attach the cactus' horticultural tape collar to the T-stakes by using long pieces of horticultural tape. Leave the T-stakes in place for three to six months, until the cactus' root system recovers and the cactus can stand upright on its own. Cut the horticultural tape off the cactus with scissors when you remove the T-stakes. Put on protective clothing, including work gloves, safety goggles, a long-sleeved shirt and long pants. Create a padded collar to protect the cactus' stem. 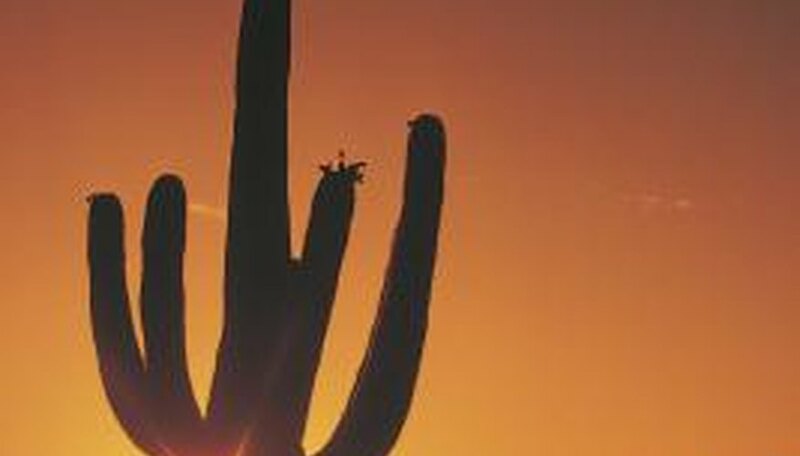 Fold a long strip of burlap several times, creating thickness from the layers, and wrap the material around the cactus' stem, including its spines, at least 3 feet above the ground. Knot or staple the burlap collar to itself to hold in place, keeping the collar snug but not tight. Wedge three 2-by-4-inch wooden boards between the burlap collar and the ground around the cactus, propping the cactus against the boards. Mound garden soil around the bottom of each board to keep it steady. Leave the boards in place for three to six months. Cut the burlap off the cactus with scissors when you remove the boards. Cactus height, not stem diameter, determines which staking method to use. If a cactus is under 5 feet tall, then use the staking method for a small cactus. If a cactus is more than 5 feet tall, use the staking method for a large cactus.